What is 30 for 30? Click here to find out. This would be my second attempt at it, but a rather short one. Short how, you wonder? Well, I signed up and everything earlier this year and thought I would give it a try but soon realized that it was not possible to do it while I was in India. For starters, I didn't have access to my trust worthy photographer on daily basis. But I felt guilty for signing up for Kendi's challenge and not giving it a shot. While a few girls have already finished the challenged and others are in their last leg ... I didn't have the heart to do it all on my own so I thought I will just join in for the last leg and do a "10 for 10" instead. Smart eh? I didn't get a chance to do a separate post on my 10 picks from my closet. I will just have to give you guys a run down of the 10 pieces I picked as we go along. So ... Get. Set. Go? If you are wondering that why am I frowning? It is the sun! Really. Also, husband duped me into doing that MJ's dance pose. No ... R.E.A.L.L.Y.! I had forgotten how comfortable these flared jeans were. I do not know why I stopped wearing them. Well, they are back now. Thank God! My ONLY impulse purchase! Back in 2005. But still. I didn't have to get this belt. I still did. Can't say I have gotten much use out of it yet but loved how it looked with this dress. You? Again, not frowning! The sun was getting in my eyes. REALLY. Even with the shades. Weird? Yes, but the honest truth! Also, can you tell it's the same dress from the previous day? It has only been 5 days since I have been back and I am already planning my next holiday. Thank God is doesn't cost much to dream. In other news, I started working out again. Can you notice the after-workout-glow? I love all the looks and have to say never seen anyone look this smart in flare jeans! And the benetton t is really cute. How come you did not get me one?!? Olive green look beautiful on you :) those pumps are lovely. the kinds you pick up in a shop before anyone dares to pick them up! Love the mellow yellows. And I did the same after my holidays-planned my next one! Love you in yellow, it loks gorgeous on you. Those jeans are so cool, too. Ooh very fun and love that off the shoulder dress on you dear! Oh man!!!!! You are such a star! I am sure you will rock this mini challenge just like you did the earlier one. my dear fab lady ..all the five looks are fab .. specially loved the Grey dress and the belt.. and the skirt and last but not the least the shoes..
Great looks, Tanvi, and I do like your dance moves! I really need to start working out again, too (i.e. playing tennis), but it's still so cold here. great styling so far ! Love all the candy colors, pink and yellow looks gorgeous on you!! Fabulously recycled :) Love all the looks! waoo u r so versatile.. i personally loved the 2nd, 3rd and 4th look most...!! 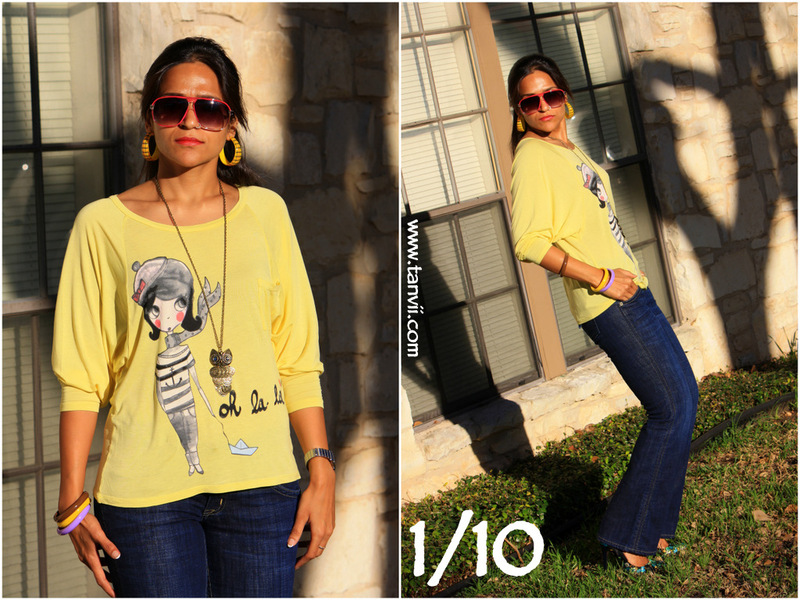 You look fabulous, I love all these looks, the Yellow shirt form Benetton is awesome! I love that blue dress, your figure! holey moley! Good luck with the mini challenge. Thge yellow jersey top is really pretty. I am also loving your flared jeans. They're a great look. 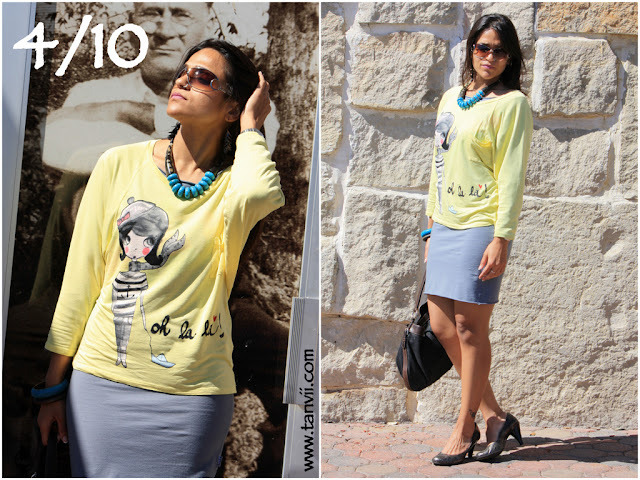 For your pictures and you awe-inspiring style 10 on 10 !! Photos are nice too..Ash is backkkkkk in the house i see :-p Loing in. Love the grey off the shoulder dress...and the belt! Gorg! I *heart* the third look. And those jeans. Glad you still participated even though you couldn't do the whole 30! goo for you for getting back to the gym Tanvi!! I just got back from my vacation...hence my blog-reading absence, and I need to get my bum back there too! Loving these look! You look beautiful in all the pictures! Love all your looks, always do. I do no always leave a comment, but I am a religious reader. But today I wanted to say this; Nothing can beat the originality you bring up. No imitating others and not looking upto what's in or not, just doing what you feel great about! love that about you... you rock Tanvi! Loving the yellows, The cardigan is my favourite with the brown studded belt. I love ALL the looks. But that dress makes you look so HOT!! Watch out or I will develop a girl crush on you. I am so glad flared jeans are back. I was not a skinny jeans girl. Can't wait to see the next 5 outfits. Love the color palette in all the outfits!! Hey my friend!! Thank you for stopping by!!! I am loving all the outfits!! You always have it going on!!!! Also love the colour combo in the last look! oh that third look is hot! congrats on working out again--i should get back to that routine as well. Love the pictures! And I have a fshion question: I see more boot cut jeans...are they back in fashion? Please say it's so! Hey Tanvi-absolutely adore that last outfit! I love yellow on you. I SO need to get back into working out. I took a break..with work and personal travel and then a slight cold it was hard to stay on track but I am starting back tomorrow with a 5 mile run...wish me luck!!! I have a great feeling about this 30 for 30 your doing! i LOVE the combination of the lemon yellow mixed with olive green... looks beautiful on you! Very cute so far! And your hair is getting so long! Yeah, I totally love those jeans on you. And they look good with flats! I've been under the impression that you've had to wear them with heels, but you've got it going on with the flats!